Visual Report Manager – PM Investigations, Inc. 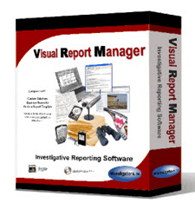 Visual Report Manager [VRM] is a complete Investigator’s case management application for Investigators. VRM has the ability to add video, pictures, reports and financial data to each case with simple click or drag and drop. With each copy of VRM, you’ll receive the ability to log billable hours that are commonly missed during the course of conducting business, compress video with custom watermarks that will quickly identify your company logo to your work product, and the Investigator will be able to quickly add reports using a custom built-in engine.